We offer four options to configure the way your customers can request an online quote from your B2B e-store. Which one will increase conversions most? Every B2B company has its own way of working, and every customer has his own preference of shopping. With these four quote request options you can easily test and find out which method will help increase your conversions most. In this blog post, we explain all four different options and how to configure Cart2Quote for each of these quotation methods. Cart2Quote was designed to increase conversions. We want B2B web stores to be successful and we see, over and over again, that enabling customers to request a proposal online significantly lowers the threshold and increases communication, quote requests, and online sales. This option is the default setting for the Cart2Quote Magento module. Here, when a customer is on a product page and clicks the "Add to Quote" button, he is directed to the Quote List. 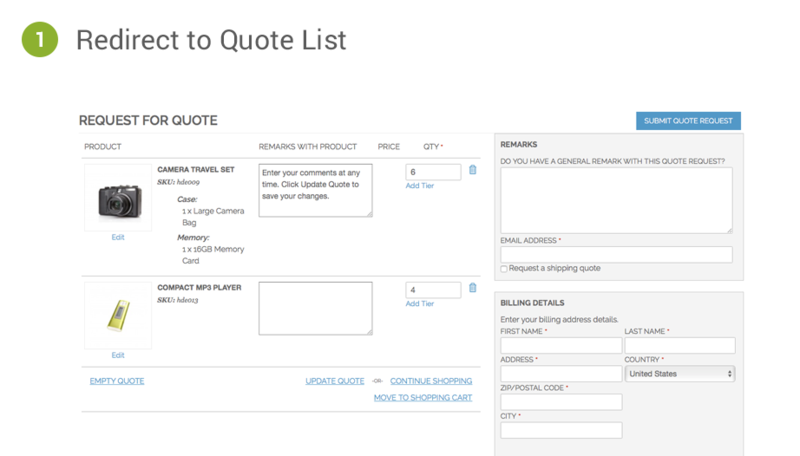 This list, like a shopping cart, gives a full overview of the products with options to edit the quote request, the quantity, add remarks per product or per quote and send the request for a custom price proposal. Of course, from the Quote List, the customer can also choose to continue shopping and add other products to the Quote List. Again, this is the default setting when you install Cart2Quote. This option is still the most used and loved for the great overview of products and options. 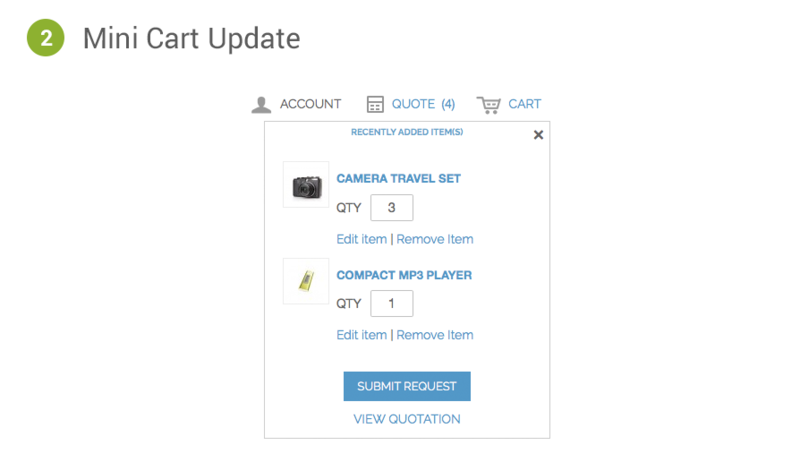 With this option set up, when a customer adds a product to the Quote, he remains on the same page as the Mini Cart, visible on the top of the page, is updated. Within the Mini Cart, the customer can edit quantities, click to go to the Quote List (Option 1) and complete the Quote Request. To set up Option 2, go to the Magento backend, and in the Cart2Quote section, in the section "Quote Frontend", set the option "After Adding a Product Redirect to Quotation List" to "No", as seen in this image. 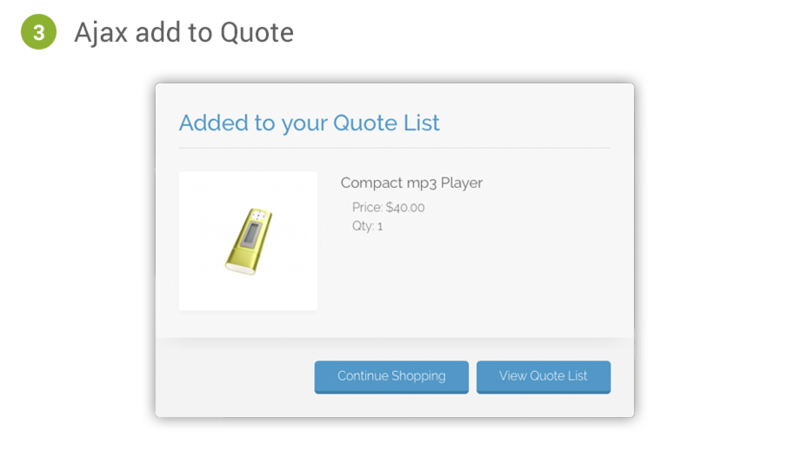 With this option, when your customer adds a product to his Quote Request, an Ajax Add to Quote pop-up comes up. This pop-up gives a clear overview of the selected products and offers the options "Continue Shopping" or "View Quote List" (Option 1). This option is also much loved for the beautiful layout and the clear way it communicates what just happened without taking your customers somewhere they didn't expect. To set up Option 3, go to the Magento backend, and in the Cart2Quote section, in the section "Quote Frontend" set "Ajax Add to Quote" to "Yes", as seen in this image. 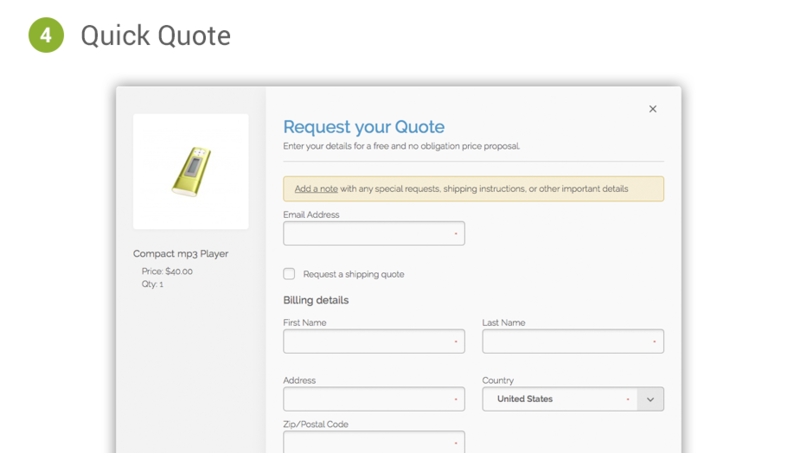 With this final option, when your customer adds a product to his quote request, a Quick Quote Form pops up. This form gives a clear overview of the product that is requested with a short form (that you can configure yourself*) to fill out and request a proposal within seconds! This option is great for store-owners that receive product requests for single products. All the product and quote information can be reviewed on a single screen without leaving the product page. A very easy, clear and fast option. To set up Option 4, go to the Magento backend, and in the Cart2Quote section, in the section "Quote Frontend" set "Enable Quick Quote" to "Yes", as seen in this image. When you use Option 4. 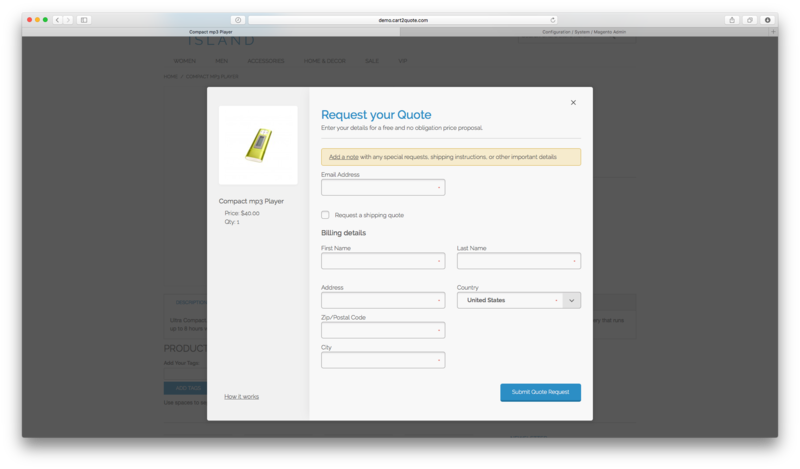 Quick Quote, you can configure the Quote Request Form Yourself. In the Cart2Quote section in your Magento backend, go to the Quote Form Builder and simply select which options and details are visible and / or required for your customers to fill out. Do you prefer details to be as complete as possible or do you want to make it extremely easy and just require an e-mail address? You decide and see what works best! What Is The Best Quote Request Method For You? Great question! That really depends on your workaround and your customers. Since it is really easy to switch between options in your Cart2Quote setup, we suggest you test. Test these options for a period of time and discover which one generates the most quote requests and orders. Please note that to enjoy the benefits of all the options you need the Cart2Quote Business Edition or higher.